Editor’s note: This article is an adaptation of the live webinar delivered by Lili Vasiloff in 2018. Her comments have been edited for clarity and length. 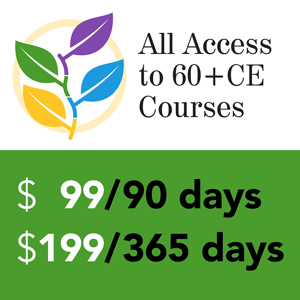 You may also choose to take the full length course The Platinum Retirement Challenge: Gray Divorce for 1.0 hour continuing education (CE) credit. What do boomers want? What will boomers experience? Why is gray divorce different than divorce generally? Moreover, why are gray divorced women affected so much more significantly than men? The easy answer is that boomers want what most couples want when they go through a divorce. There are no unique characteristics or particular reasons other than one time I heard my 98-year-old divorcing client tell me she was tired of taking care of her spouse. Beyond that, what boomers seem to want are what everyone wants: higher standards in relationships, to seize more opportunities to become fulfilled and to feel entitled that they have a life that they can live more fully apart from their current partner. What will boomers experience? Well, we all know that statistics show we will have longer lives. We do have declining disability rates and somewhat improved healthcare systems. We have longer work trajectories and broader career paths including those for women who have gained greater financial independence in recent years. However, there is also the divorce echo effect that boomers experience, and this is when older individuals are more likely to be in remarriages. Remarriages have an even more dire statistic of divorce. Second remarriages have a divorce rate of around 67 percent. And third remarriages have a divorce rate of 73 percent. Why is Gray Divorce Different? In general, the older you are the more complicated your life is, financially speaking. At this stage in your life, boomers have many challenges. They have demanding jobs that require 60 to 80 hours of time per week. They may have college tuition bills that collectively cost even maybe more than your client’s house. They have perhaps financial responsibility of caregiving for elderly parents. Moreover, we have heard the stories about adult children who boomerang back home, unable to find a decent job on their own and adult children who spend down your client’s assets without financially contributing to the household. Adult children may conflict with your client in a family owned business and put at peril family succession planning for that business. What about children who come into a second marriage or a blended family? How do they integrate? And lastly, sky-rocketing health insurance premiums and medical issues require more from your clients than simply taking it easy. How are boomers preparing for retirement? This is our key question with the transfer of wealth coming in this next generation. Are boomers preparing for retirement? Great question. Statistics show that 29 percent of households age 55 and older have neither a retirement savings account or a pension. Of the 36 percent of married couples who say that their partner is saving for retirement, one in five has no idea how much they are saving. 21 percent don’t even have a general sense of the value of their partner’s retirement account. “Are they, in fact, preparing for retirement?” is the question. 30 percent of respondents with at least one partner saving for retirement do not talk to the other about how much money they will need to retire. Nearly 40 percent of all couples surveyed disagree on the lifestyle they expect to live during retirement according to a 2013 Fidelity study. And not only that, half of them disagree on the retirement age. So, despite these concerns, it is interesting that only two in ten couples actually sit down to prepare a detailed retirement income plan to make sure or to ensure that they don’t outlive their savings. Well, you see the ticking time bomb. We have mismatched expectations for retirement years: everything from the amount that you are saving to what it will cost, to when you retire, to what you will do during retirement. We have a lack of knowledge about retirement savings and the resources available to your clients. There is a lack of communication in most marriages about planning for retirement. And this is a kicker: there may be a potential age disparity between the two spouses of significance. I call a decade or more significant. When you add divorce to this mix, you find that older divorcing adults will now be facing financial challenges on the same issues they have avoided talking about for years. They are going to have to look at their assets and decide how to cherry pick or share equitably the various kinds of assets they’ve accumulated. They may have to break up or reconfigure family-owned businesses. They may have to downsize lifestyles. Most importantly, they will negotiate retirement benefits between themselves. Many times, older divorcing adults who have substantial assets and have peak earning years will also deal with complicated compensation structures, such as: restricted stock, stock options, executive comp packages, performance bonuses, capital accounts invested in partnerships, employer-provided perks, meal allowances, travel, financial, legal services, apartments, and bodyguards. They will also have to determine future cash flows for support purposes in contemplation of when the earning years will cease. Outside of the normal scope of discussing routine daily living expenses, they may have to determine how an inheritance impacts their divorce: does it affect the division of marital assets and liabilities or even support? We mentioned that gray divorce is not spread evenly among the demographics, and it is especially likely to occur among couples who are socially and economically disadvantaged, raising concerns about long-term healthcare issues and their wealth and wellbeing. Older, divorcing adults are unlikely to recoup financial losses associated with divorce or to improve earnings powers to build up their savings. The time horizon is too short. So who is significantly affected? Older women who are vulnerable in many different ways from this generation. For older women, the loss of accumulated wealth and income is harshest if they have been out of the workforce for a significant period. Gray divorce women have relatively low Social Security benefits on their record and end up with relatively high poverty rates. Approximately 20 percent of older, single women rely exclusively on public benefits and live in poverty. The Platinum Challenge in retirement for gray divorce means that you may have a reduced financial cushion, longer life expectancy with fewer assets and wealth, increasingly complex family structures and dependence. We are seeing that the typical family with biological parents and children is only one in five families in the US today, which means we have blended families with adopted children, surrogacy, half-children, step-children, you name it. We also have elder care issues and healthcare issues. The biggest problem is income uncertainty during these retirement years. What Do Advisors Need to Know and Practice About Gray Divorce? You need to recognize that gray divorce is a perfect storm that impacts your clients. I invite and encourage you to seize the opportunity to address the essential concerns and all the potential contingencies with forward thinking on behalf of your clients, even when your clients are unwilling to prepare, listen, or act for themselves. You should recognize that clients will have unique needs after divorce during the retirement years that must not be ignored or postponed. 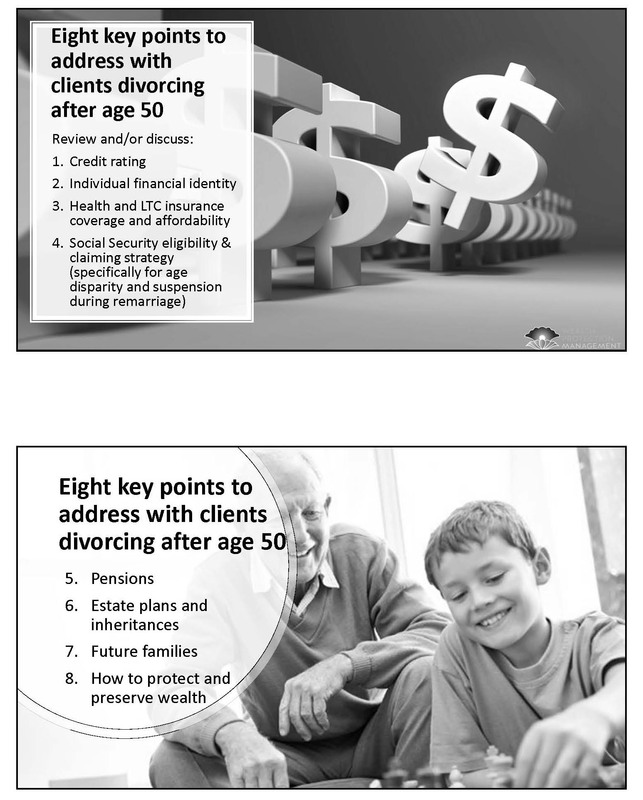 Eight key points to address with your clients who are contemplating divorce, going through a divorce, or nearly are divorced after the age of 50. Review and or discuss credit rating with your clients. Do they have an individual financial identity? Do they have healthcare and long-term care insurance coverage? Is it affordable? Is it accessible to them? What is their Social Security eligibility? What will be an appropriate claiming strategy? If there is a significant age disparity between the spouses and if they intend to remarry, there will be a suspension of benefits. You want to look at pensions and any benefits with that pension, such as healthcare or COLA adjustments for future years. There are estate plans and inheritances that may need updated beneficiary designations. Are your clients anticipating having second, third, fourth remarriages? Consider how to protect and preserve their wealth without any earning capacity during the retirement years, or if they do plan to remarry or cohabitate with someone. Let us take a broader view and put it within the context of the law because making financial decisions and analysis are all taking place within the context of the law. How does the law look at gray divorce? Your state law governs divorce. Each state legislates its own laws for divorce, separation, and annulment. Divorce occurs as a formal court procedure. It is a legal order or a legal judgment. All 50 states now offer some version of no-fault divorce. No-fault divorce defines any divorce where one spouse does not have to prove that the other one did something wrong to file for divorce. There are two kinds of divorce: contested and uncontested. A contested divorce is one in which spouses cannot agree either about getting divorced or about any terms of one or more issues in the divorce. Those issues are generally about two significant categories: children and money. If a settlement cannot be reached in a contested divorce through negotiation, ultimately the client may have a trial, and a judge will make a binding decision. When you go to trial, anything is possible. Generally, the result is dissatisfying for both parties. The rule of thumb is, if they are both unhappy, neither one is likely to appeal because there’s no clear win-win. In an uncontested divorce, which is the second kind, spouses have negotiated all of the issues. They have agreed on everything, they have reached a final agreement, and they do not need the court to intervene and make a determination for custody, property division, or support. An uncontested divorce will move quickly through the legal system. It is less complicated, less costly, and more likely to be the product of spouses who have done their own divorce, whether through a mediator or attorneys. About 90 percent of all divorces get settled without ever going to trial. Financial issues include property division, child support, spousal support (alimony), and college for many states. In property division, most states determine whether the property is marital or separate. Note this please: definitions differ significantly from state to state as to what is considered marital property or separate property, and all states will distribute property in one of two approaches: equitable distribution or equal/community property. There are only nine states that follow the community property approach. Any property that is transferred between spouses pursuant to a divorce order is a non-taxable event. The cost basis of every asset transfers to the new holder of that asset. Even though there is no taxable event at the time of property transfer between spouses, you should pay close attention to the cost basis and the tax impact of those assets if your client liquidates, sells, or holds the asset post-divorce. Never overlook the tax impact. The rules will vary widely among every state. Usually, each state picks an effective date to value the property. The effective date could be anything from the date of filing for the divorce to the date of the actual divorce. Most property decisions are a one-shot deal. They cannot be renegotiated or reopened after the divorce is final. There are very few legal exceptions that exist for reopening a judgment or appealing a decision. The legal hurdles are incredibly high. And this includes anything that clients believe was true and later found out on their own to be fraudulent. Even then, it may or may not come to that basis. So what do you tell your clients? First, they must persist in full discovery and an accurate valuation. They must obtain all policy plan documents, as tedious as this sounds, to understand what the retirement benefits are, where the trigger dates are for initiating those benefits, and if there are survivor entitlements. Do not overlook any difficult-to-value assets or intangible assets such as unvested awards, private equity investments, family businesses, and even good will. Remember that debts are part of property division too. Moving from property, consider financial support and lifestyle. The definition of spousal support or alimony is a legal obligation of a person to provide financial support to his or her spouse during the marriage while the divorce is pending or after marital separation or divorce. It is an entitlement system based on numerous statutory factors and case law in each state. These factors and case law vary from state to state. Only 10 to 20 percent of all divorces involve some element of alimony or spousal support. Lately, the courts are awarding less spousal support for shorter periods of time. That is a nationwide trend. With the recent change in the tax law, the alimony deduction is the only deduction that was made permanent, which then impacts almost every calculation in divorce since alimony is the only one where you can shift tax subsidy between spouses to achieve maximum cash flow. Spousal support awards are complicated to negotiate and far and few between to obtain. There are no guarantees that both spouses will have sufficient means or capacity to support the same lifestyle they had during their marriage after divorce. There is no universal formula or standard for awarding spousal support. Only a few states have methods for calculating support. Spousal support can be waived forever or preserved with just a dollar a year award written into the divorce judgment. Courts have extensive discretion over awards, and they can vary enormously among different county jurisdictions and even to the judge you have presiding that day. Spousal support, is usually the very last piece of the financial puzzle to fall into place in divorce. According to a survey by the American Academy of Matrimonial Lawyers, the top three areas of dispute in gray divorce are spousal support (83 percent), retirement accounts and pensions, and business interests. The most common area of disagreement was housing and real estate. What are the obvious risks? You have ex-spouses entitled to a long duration of spousal support that are effectively being robbed because of their proximity to the normal retirement age. Many spouses are going to have to work past normal retirement age if spousal support terminates or is modifiable. In a gray divorce, particularly where neither spouse is working and they have to both survive on fixed incomes, being able to boost income with the spousal benefit can make a huge difference. Divorcing on the cusp of retirement typically takes place in peak earning years for individuals that have a lifestyle reflecting the accumulation of their hard work and wealth. It is a time for serious reckoning by clients to realize that these peak earnings that have funded a household’s mature lifestyle may or may not last much longer than a few years. Accumulated assets that are now being divided may not be sufficient to support two households post-divorce, because of limited time to retirement age and reduced earning capacity. Are people then inclined more or less to work past normal retirement age? In survey after survey, significant percentages of workers say that they plan to work well past the traditional retirement age of 65. In a Gallup poll published in May 2017, 31 percent of nonretired adults said, “Sure, we’re going to work past age 68 or older.” In another study published by the Employee Benefit Research Institute in March 2017, 38 percent of the workers said they expect to retire at age 70 and beyond. According to the Bureau of Labor Statistics, about a third of Americans 65 to 69 were employed past age 70. A growing number of seniors are declining to or are unable to retire. And this trend is up 22 percent since 1994, comparable to the divorce trend. When the Federal Reserve asked retirees to identify sources of funds in later life, only seven percent of respondents said that they had earned income from a job. If an individual works past normal retirement age, you should know that they may or may not be ordered by the court or the legal system to continue to pay spousal support to their ex. Some states have legislated successfully (and many more are seeking laws) to terminate spousal support at normal retirement age, even if that ex-spouse continues to earn income. Why is there a disparity between workers’ plans and retirees’ experiences? What are the downside risks of working past the retirement age if you are divorced? For the payor of alimony, you may be obligated to continue payments until you are no longer working. It may be difficult to seek a downward modification of the amount that you pay if your ex-spouse’s expenses have decreased, and you are trying to prove that the costs are less because courts are generally protective of ex-spouses in old age. For the recipient of alimony, if you file for Social Security benefits while collecting alimony, your income may be high enough to have the Social Security benefits taxed at federal and state levels. If you are receiving Social Security benefits on your ex-spouse’s record, remarriage will suspend all benefits for one year until you requalify under your new spouse’s Social Security benefits record. There is a gap of income for at least a year. If there is a time gap between qualifying for Medicare and coming off of COBRA coverage, clients may have to go to work to secure medical insurance. That puts at risk a downward modification in alimony. So why is there a disparity between the workers’ plans and retirees’ experiences? The easy answer is life is messy. Health problems, layoffs, the need to care for a loved one, age discrimination, a scarcity of job openings in your client’s particular area, any of these circumstances can and do push people into retirement far earlier than planned. Divorce adds yet another layer of the need for both emotional and financial recovery that really may keep you from being so productive in the workforce. And the facts all suggest that gray divorce is imperiling to wealth. During the divorce process, what can you do as an advisor? 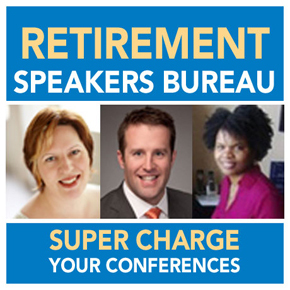 How can you uncover opportunities to maximize income, to preserve wealth for your gray clients? Focus on these financial areas. I have found these three to be the most significant impact in providing confidence and a sense of security for clients post-divorce. The first is cash flow. The second is retirement assets. The third is dividing the retirement assets. Consider cash flow from the retirement assets. How do you get cash? In divorce, there are unique opportunities to do things that are exceptions under IRS rules. Under IRS Rule 72(t), you can withdraw cash without penalty before age 59 1/2 from a qualified retirement plan (but not an IRA) through a qualified domestic relations order (QDRO). The QDRO must specify the exact dollar amount in cash and where it will be distributed. If you are dividing an annuity, you absolutely should predetermine if the annuity is divisible during the divorce with the same terms between the ex-spouses for each spouse post-divorce. Does it have to be transferred in ownership, or does it have to be canceled and replaced with a new policy? Can it continue to be held jointly if the parties are divorced? What is at risk? What is the cost of ownership transfer, a division of benefits, or opening comparable policies individually? If the annuity is in payout status now, we have a different ballgame. Can those distributions be segregated in each spouse’s name? Annuity companies will tell you time and time again different stories depending on whom you contact. Each annuity company has very different rules. You should always identify if any loans exist against the retirement accounts by an ex-spouse. You should always be dividing the account net of loans. This verification also applies to whole life insurance that has cash value in it. You always want to ensure direct transfer of retirement accounts from custodian to custodian according to a divorce decree to avoid any possible taxes or penalties. This is true in divorce as well. Note that IRAs do not require a qualified domestic relations orders. They do not need a certified legal order to divide them. They must be divided post-divorce. An atypical situation might be this: assume your client’s spouse has received an inherited IRA (from their deceased parent) and it is in payout status. The ex-spouse who receives half of that inherited IRA must step into the shoes of their ex-spouse and continue to receive the same RMDs. They cannot recalculate that IRA over their own life expectancy as they would be able to do with a straightforward IRA that is not in payout status. The most critical area for a divorcing client to consider is a pension. Find out if the pensioner has multiple options for joint with survivor benefits. Sometimes it is 50 percent, and sometimes the scale goes all the way to 100 percent of a lifetime benefit if the pensioner dies during the payout period. Does the alternate payee also have an election option at the trigger date? Once the pension has been divided through a QDRO, does the alternate payee have their own election option to take it as a lump sum or as a payment stream? You should definitely confirm that an ex-spouse has never signed a spousal waiver to the retirement account or plan benefits either during the marriage or the divorce process without knowing about it. A waiver absolutely affects the division of the pension in divorce and the survivor benefit calculation. Lastly, if the employee’s spouse dies before retirement, does the plan offer a pre-retirement survivor annuity to retire early with a reduced lifetime benefit? Very few divorcing spouses are aware of this. Consider all retirement cash flows: is there an opportunity to equalize income during the retirement years from all sources of income, such as Social Security benefits, RMDs, pensions, investment income, annuity income? If you have a client who is a teacher or is in the military, special conditions exist that may impact Social Security benefits and affect how much the pension should be shared with that spouse if you are aiming to equalize retirement cash flows. In some states, case law suggests that it’s possible to force a decanting of a trust to either divide the assets held in that trust or to access income from that trust. In divorce, life insurance is typically required to securitize any support obligations. One of the key parts of divorce for individuals who have family-owned businesses is how you value them and what stream of income will continue to be provided or divided between the two spouses. Family businesses have different methods of determining each spouse’s share of ownership interest, the value of a capital account, the buyout or buy-sell agreements between partners, formal or informal appraisals, business valuation or key man life insurance. One of the most controversial areas for valuing a family business is the concept of double dipping. This idea refers to the double counting of the family business as both an asset in property division as well as an income stream in the award of support. The theory is premised upon the fact that the same cash flows that are capitalized to determine the value of a spouse’s business are also the same component used for a spouse’s income from that business. The result of a business valuation is very often misinterpreted and misapplied by the courts, and often a battle of the experts. But in the simplest of terms, it really comes down to deciding if a business valuation is based upon the averaging of past income, or is it a projection as to what future income will be? The methodology for a business valuation as well as the premise of double dipping are critical determinants in a gray divorce. 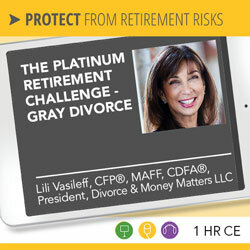 The platinum challenge of retirement is made so much more complicated by gray divorce. Just as in every divorce, there are sequential financial phases to complete. Clients and professionals are often sidetracked by emotional, legal and psychological issues. Divorce is a legal process that is more focused on the past than the future. You call in the divorce financial expert. The role is defined and circumscribed very cleanly by what the legal process is all about. As advisors, the hats we wear could be as an advocate, as a neutral, or as an expert witness. Above all, apart from all other advisors involved in our clients’ lives, we have to play by the rules of somebody else. We are in someone else’s sandbox, that of the legal professional. We are fee-only financial planners that have absolutely no bias of selling product in this process, per se. We are trained in interdisciplinary legal and financial issues. 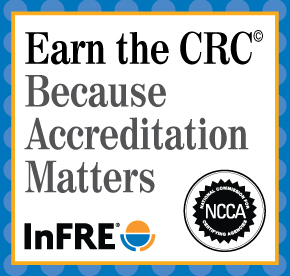 We adhere to our professional standards, codes of ethics, and protocols. As any divorce professional, we must carry professional liability insurance. We are often the lightning rod for very unhappy and dissatisfied clients. Divorce is especially complicated and expensive for people over 50. As an advisor, you can demonstrate how much you care about your client’s well-being by pointing them to a divorce financial expert who will save them time and legal fees and money during this process. Your client will benefit from the critical step of understanding their financial situation within the legal context. They will work with the financial expert who will operate seamlessly with their legal professionals, and they will initiate a divorce with a greater sense of confidence because they will know how to have prepared for it. In summary, the trend in gray divorce reflects a shifting meaning of marriage in the United States. Divorce has become acceptable if a marriage is unsatisfying. More boomer women initiate divorce by 66 percent and claim satisfaction almost 70 percent than men. For some older adults, a divorce is a liberating event from a relationship that simply has run out of steam. But no matter what the trigger or the reason for gray divorce, coupled with the general reluctance to talk about retirement planning throughout a long-term marriage, this comes down to a combination of dangerous silence and ignorance of your parties. As an advisor, you should be in a position to provide clarity on the topic and claim some degree of authority to help guide them. You can offer a better education for more effective approaches for gray divorce because your wisdom will cut two ways: keeping your clients from developing false ideas and expectations during a divorce and preventing your clients from making ignorant decisions during the divorce process. Most importantly, ask your client about what they project as their lifestyle and what their needs will be post-divorce. Focus on expected cash flow needs and how to replace income. Manage their expectations and help them by referring them to a divorce financial expert. Admit what you do not know. Educate them about the interplay between shorter- or longer-term alimony and Social Security claiming strategies. Revisit all their estate plans, update their beneficiary designations, but most of all, be truly neutral if you are working with a divorcing couple if you hope to retain both or either one as clients. Lili Vasileff, CFP®, MAFF, CDFA®, President of Wealth Protection Management, is a nationally recognized expert practitioner, leader, author, writer, and speaker about financial planning for wealth protection. Lili is sought after for her seasoned experience and deep knowledge about complicated financial issues in wealth management and is called into cases that have national recognition. Lili is qualified as a testifying expert in courts. Lili Vasileff is one of the distinguished trailblazers of divorce financial planning who has been a catalyst in developing a professional niche that has led to an international movement and thousands of practitioners today. A highly regarded educator, trainer, and speaker, she is sought after by international financial planning institutions and legal professionals. Lili Vasileff serves as President Emeritus of the Board of Directors of the national Association of Divorce Financial Planners and holds active memberships with the Financial Planning Association, the Connecticut Council of Non-Adversarial Divorce (CCND), CT Bar Association, New Haven County Bar Association, Fairfield County Bar Association, New York Association of Collaborative Professionals, Collaborative Divorce Team of Connecticut, Institute of Divorce Financial Analysts, and International Academy of Collaborative Professionals. She is also a founding member of the Collaborative Divorce Team of CT, and currently serves as the Chair of the Finance Subcommittee of the New York County Law Association’s Family Law and Child Welfare Committee.